The word tessellation comes from the Latin: Tessella; which was a small Square stone or tile used in ancient Roman mosaics. Tiles and Mosaics are common synonyms for tessellations. A plane tessellation is a pattern made up of one or more shapes, completely covering a surface without any gaps or overlaps. Some shapes, or polygons, will tessellate and others will not. As for the regular polygons, tessellations can easily be created using squares, equilateral triangles and hexagons. I choose to use the equilateral triangle because of the unique visual arrangements it seems to lend itself to. It seems to both perplex and then amaze first the creator and then the viewer. The major focus of this lesson is to surreptitiously introduce the teaching of math concepts across the curriculum. 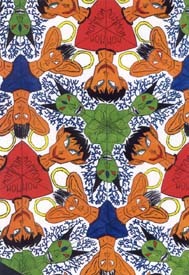 The student will produce a tessellation of original design, developed using an equilateral triangle, where three unique symmetrical faces rotate through out their creation. The student will effectively use shape, pattern/repetition and color to create a striking composition. The student will use imagination in creating a "beastie" inspired by bestiaries of the Middle Ages. The art of M C Escher and the mosaic designs of the early Moorish Mosques are excellent examples that can serve to motivate students and serve as historical exemplars. Video: "Gargoyle: Guardians of the Gate "
1.) We begin by drawing symmetrical faces. I give each student an 8 ½ x 11 (21.5 x 28 cm) with four vertical lines. They are to draw half of a face (front view) next to each vertical line. Then they fold on the lines and carefully trace the other side of each face. Unfolding the paper should produce a complete "symmetrical" face, each side being a reflection of the other. Even at this point I instruct students to make each face as different as possible from any of the others. This initial step is an opportunity to develop ideas, and to practice the skill of tracing. We find the classroom window to be better for this purpose than using a light box. Note: My students began by watching the Video "Gargoyle ". We discussed the purpose of gargoyles and talked about their uses today on architecture. Students pointed out gargoyles they have seen around this area and while on vacations. Students also use the Internet to learn about Medieval Culture. 2.) Worksheets with two equilateral triangles (rhombus) should be made available to the students next. Some may start over several times. The teacher needs to insure that the triangles they are given are as perfect as possible. Each minor error increases the problem of correctly matching the finished designs into a tessellation. Note: My students used handouts of Medieval Beasties and handouts of animals to come up with ideas for our Tessellations. 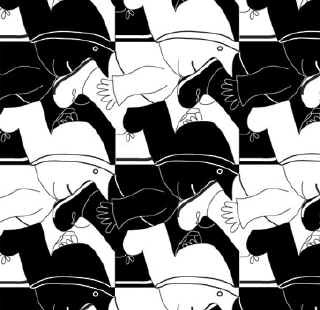 The work of M. C. Escher was also helpful. Students were also encouraged to have their negative space (the face around the beasties) relate to Medieval art and architecture. 3.) Students should be instructed to draw three ½ faces on the inside edges of "one" triangle only. The faces should be as different from each other as possible, to provide variety in the design. I often use as examples - a clown. a cowboy & a little girl (or) an angel, the devil & a monster to begin them thinking about contrast. The final designs rotate best if each of the three faces points in a different direction. In other words, if no two tops of heads point toward each other. 4.) Each of the three faces should somehow fill the entire space available. This is best done in a creative manner, for example - the hair on one head can become the fur collar on the next face when viewed from a different perspective. Another two faces might share lines and shapes that viewed one way looks like the crown of a queen, but from another angle becomes the shirt of a sailor. The most difficult problem is utilizing the space in the center, of the triangle, between the three heads. It should not be left empty. 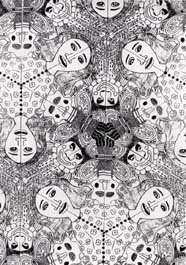 It works best when somehow the shapes of the three ½ faces blend together to fill this space. Note: My students drew Medieval beasties. Students were encouraged to have one shape /form merge with another. 5.) After the three faces inside one triangle are finished, the lines should be darkened. (This makes them easier to trace and they will copy much better, later on the copy machine). Next carefully fold the paper so that the two triangles line up precisely as seen through the folded paper. Explain to the students that they are folding the rhombus on the centerline and that the edges of the paper itself will, most likely, not line up. At this point the students should carefully trace the image of the first triangle onto the second. This traced reflection should be an exact copy (as much as possible) in order for later Xeroxed copies to match up with each other. A more dramatic and visually striking design will be produced if the students also darken in areas in the design. This too must be symmetrical. 6.) If you Have access to a good Xerox machine, twelve copies should be made of each design. If the students put their name outside the triangles, their name will be on every copy made. When cutting out the 12 rhombus shapes, do it carefully and exact, one at a time. They must be as precise as possible. 7.) Practice laying out the design before trying to glue it down. Arrange 6 shapes into a six-pointed star first. Then the remaining shapes should fit in between the points of the star to create a hexagon. Of course if you made more copies and had a larger surface to cover, you could have your design continue on and on. Glue shapes down carefully, making sure they match. You may need to adjust shapes or overlap a bit to make everything fit. Each error in drawing, folding, tracing, copying, and cutting multiplies the problems in getting the final design sections to align. Note: My students made two tracings of their rhombus onto a template of three joined to make a hexagon. I made 3 copies of the hexagons. Students glued three together in the center then cut one apart to fill in the rest of the hexagon. We made ours fit on a 12"x12" (30.5 x 30.5 cm) sheet of Drawing Paper . PROBLEMS -The image (Rhombus/Triangles) sometimes seem to get stretched while they are being copied in the machine. The teacher needs to be aware of this and watch for the problem. Make the students aware also so they do not become frustrated with their own abilities. In a perfect geometric world, it should work. 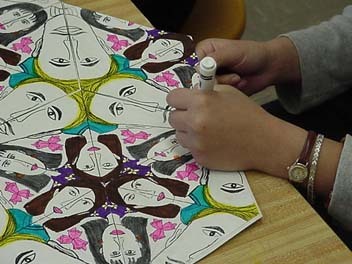 ADDING COLOR - Colored markers make these tessellations really look fantastic. To do the color correctly (tessellate the colors also) each time a shape repeats in the design, the color should repeat as well. Assessment of student learning should be an ongoing monitoring process done while assisting students in the new learning. Monitor how well students grasp the new concepts and assist only as needed as they progress through each step. Help enough to avoid frustration but don't solve every problem for them. Final assessment is done by their peers and other teachers in the building. When the finished tessellations are put on display, they will be viewed as a very difficult and complex endeavor, at least to those who do not understand how they were created, Let them marvel. The students who created the designs can keep quiet as to how easy the design was to create, but only if they choose to do so. My student work: This student's work is different from everyone else's in more than one way. He wanted to feature each of the three beasties in the center of his rhombus -- but he still had to meet the requirement of reflection. It took some problem solving for Chris --but he decided to make the space around the beasties reflect. See detail one, detail two and detail three. 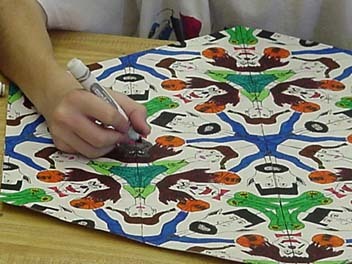 When students were finished coloring their triangle tessellations, they moved right on into a construction paper assignment using the posters designed by artist, Jim McNeill for Crystal Productions. Students had already been introduced to Jim McNeill via the Internet (Know the Artist: Jim McNeill). Students had many questions for Mr. McNeill as they worked on their project. We had several email exchanges. Jim really enjoys working with kids. This assignment did not count as much as the beastie project and students who were "stragglers" finished it as a homework assignment. Many of the students had already done similar tessellations in math class (theirs were done with Colored Pencils - while ours was done with cut construction paper so they would have a different experience). 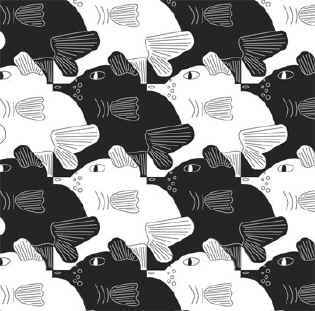 Video: Tessellations: How to Create Them . If Amazon is sold out of this video, you can also buy it at Crystal Productions. Book: Tessellations: The History of Making Symmetrical Designs by Pam Stephens, illustrated by Jim McNeill. Review directions (follow posters) - create shape to tessellate on index stock. It is helpful to create table sets of instructions from the posters. Students could also go up and look at the posters during class and could use the computers to review the demonstration online. Develop a center of interest with accent colors. Outline and add pattern/texture with Sharpie markers. Students who finish early may try a different kind of tessellation -- students who do not finish may finish as a homework assignment. This project was only graded on a scale of 10 points as only one class time was taken to work on it. This was a "time filler" project as we waited for students to finish coloring. Our follow-up project was ceramic Gargoyle boxes. In my high school graphic art classes, I incorporate tessellations into my lessons on positive negative space in layouts. We usually all work around the table first before moving to the computer. I hand out paper squares, scissors, pencil, and scotch tape. I walk them through the process of creating a free form tessellating shape from their square. Then we have fun trying to use our imaginations to turn the shapes into something recognizable. So the kids help each other and you hear comments like, "That looks like a turtle playing football!" I facilitate by trying to help the less creative students see their shapes. Believe it or not, I have wiggly eyes on hand. The kids try turning their shape in various ways, then place a wiggly eye or two around and often times they see something instantly! Voila! Inspiration has occurred! Once everyone has an idea, we move to the computers to use Adobe Illustrator to create the 12" x 18" (30.5 x 46 cm) tessellation. Then the technology really comes in handy!